This particular area of concern is what the military, police, and IT folk refer to as neurosecurity, a burgeoning field nestled within the broader and more established domain of biodefense. While many of the technologies required to diminish or manipulate someone's thought processes won't exist for several decades, some are available right now. I spoke to two leading experts on the matter who told me what we can expect in the coming years, and what we should be doing to ensure these weapons are safe, effective, and not prone to abuse. Neuroscientist and neuroethicist Dr. James Giordano, a professor at Georgetown University Medical Center, Washington D.C., and author of Neurotechnology in National Security and Defense, described neurosecurity to me as, "the achievement and/or sustainment of some security initiative or agenda through the use of neuroscientific techniques and technologies of assessment and intervention." He says this term has more recently been referred to as "neuro-deterrence". Neurosecurity expert Dr. Jonathan Moreno from the University of Pennsylvania told io9 that it involves both defensive and offensive capabilities. Moreno, the author of Mind Wars, describes it as, "managing the use of tools provided by the neurosciences for purposes of protecting the security and interests of the sovereign state, along with its friends and allies." Neurosecurity can thus involve everything from boosting the psychological morale of soldiers to incapacitating enemy combatants with sophisticated "mind-jamming" devices. Recent breakthroughs in neuroscience have attracted the attention of military planners who have started to take an active interest the so-called dual-use potential for neurotechnologies, including their application as neuro-cognitive weapons. Washington Rallying the Troops at Monmouth by Emanuel Gottlieb Leutze. An early form of "mind control?" "The rapid pace and considerable breadth and depth of recent developments in neuroscience and technology have enabled new knowledge about the structure and function of the brain," says Giordano. "Such knowledge, tools and technologies allow insights into individual, collective, and inter-group thought, emotions, and behavior that might be used in intelligence analysis and operations, and understanding aggression so as to develop more effective strategies and tactics of deterrence." To be fair, the military's concern with manipulating minds is nothing new. As Moreno reminded me, psychological warfare, or psy-ops, is the immediate precursor to these technologies. 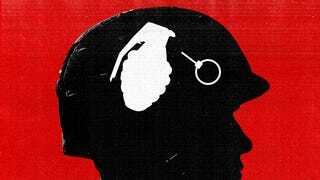 People responsible for fighting wars have long known that the psychological implications of conflict are extremely important. Back in the 19th century, for example, the Prussians tried to stimulate their soldiers with cocaine. During the Vietnam War, U.S. commanders experimented with methamphetamines like speed. And during the Cold War, the British considered the use of LSD to incapacitate enemy forces. "What's changed is the instrumentalities," says Moreno. "Commanders have always been interested in wanting to psych up their own soldiers while undermining the confidence of the adversary. Today we call that propaganda." And in the future, when these tools become more cognitively invasive, we'll call them neuro-weapons, which Giordano describes as the use of neuroscience to "contend against others," most notably to deter motivation, will, and/or the ability to engage in aggressive action. Drugs: There are particular drugs that act upon the central and/or peripheral nervous system that can be used to 1) alter concentration and vigilance (to increase or decrease combat warfighters' performance on various tasks), 2) alter sensation, perception and emotion (to induce feelings of fear, confusion or even amiability), and of course 3) incur profound debilitation — and death. Bugs: There are a number of microbiological agents ("bugs") — viruses and bacteria — that can induce a host of neurological diseases (such as encephalitis, meningitis), and effects (such as cognitive and motor manifestations). Toxins: A variety of organic neurotoxins that are derived from cone snails, octopus, shellfish and venomous snakes (for example cobras, mambas, etc) that can be used at very low doses to disrupt neurological function to induce paralysis, illness, and even death, which make very effective "in-close" weapons against important and high profile individual targets. Bytes: The use and style of both evident and subliminal information ("bytes") in narratives and discourses that can be rendered in traditional and various social media to affect neuro-cognitive processes of thought, emotion, decision-making and action. A neurologically-based form of propaganda and psychological operations (PSYOPS), if you will. More formally, Giordano, along with his colleague Chris Forsyth, have described these areas as nano-neuroscience, advanced neuropharmacologicals, neuro-imaging and neuro-manipulative devices, and neuroinformatics and cyber-neurosystems. Every year, the U.S. Army holds its annual "Mad Scientist Future Technology Seminar." Seriously, that's what it's called, and it certainly lives up to its name. Back in 2010, it brought together a dizzying array of scientists, scifi authors, futurists, government and private sector people, and academics to discuss the military implications of emerging science and technology. The meeting was framed in terms of identifying how nascent technologies will create new threats for the U.S., but it could have easily doubled as a DARPA to-do list. Among the items discussed — and you can read the entire unclassified summary of the meeting right here — were electro-magnetic pulse (EMP) weapons, robotic swarming weapons on the nano scale, and social networking attacks in which a soldier's friends, families, and colleagues could become vulnerable to virtual attacks. Unlike Giordano's list, many of these prospective weapons are a bit hand-wavy. But taken in sum, it suggests that future warfare is likely to depend less and less on 'kinetic' actions (I interpret this to mean actual, live battlefields), and more on the ability of enemies to indirectly or virtually control or manipulate soldiers. As noted in the summary, "Kinetic action will be used to support other types of non-kinetic operations that will increasingly come to represent the main effort." Though it sounds like something out of a Neal Stephenson novel, there may be something to these sorts of speculations. A couple of years ago, the Royal Society in the U.K. put out a report which went into great detail about how neuroscience could enable performance enhancement in soldiers, for the purpose of customizing and directing their training. But it also addressed the potential for what it called neural degradation. The authors of the report said that neurotechnologies could be used to define sub-conscious abilities in soldiers — say, a subconscious visual ability — and thus aid in better target detection. This could directly bridge the gap between machine and human, while eliminating volition from the execution of a task (if, say, a weapon relied on human reflexes — but not volition — to fire a weapon). In terms of specific enhancement neurotechnologies, the authors describe neuroimaging technologies (like MRI, fMRI, EEG, etc) to help the military identify specific traits in soldiers, and brain stimulation techniques, like transcranial magnetic stimulation, to aid in training soldiers and for enhancing learning and memory. The authors also talked about the potential for neuropharmacological agents (i.e. drugs) to help soldiers stay awake and maintain performance in sleep deprived states and to help them deal with stress, PTSD, and so on. Neural interface systems, or brain-machine interfaces, could aid in both remote control of military systems and in the rehabilitation of soldiers. But as we already mentioned, neurotechnologies could also provide for the opposite — the ability to degrade an opponent's mental capabilities. While neuropharmacological agents could be used to incapacitate enemy combatants, most fall under various international treaties that ban chemical warfare. Directed energy technologies (like LRADs, also known as sound cannons) are not regulated internationally, and could be used to incapacitate individuals. More radically, and certainly more controversially, there's also the prospect of rapid-onset, brain-targeted biological weapons. Moreno, in Mind Wars, describes a scary scenario in which targeted viral and bacterial pathogens could be engineered by insertion of transgenes equipped with properties not naturally found in the virus or bacterium. These bioweapons could be used to target the brain and nervous system. Want to Stay Healthy? You&apos;ll Need to Become a Human-Animal Hybrid. As noted by Moreno, "In such advanced neuroweapons, the infectious pathogen is really just a Trojan horse, selected for its ability to get the synthetic gene quickly into a target it cannot otherwise reach." Once in the body, the virus or bacterium could function as malign neuro-modulators, disrupting brain function by changing the relationships and communications between neurons. It would be a potent example of converging technologies, in this case, biotechnology with neuroscience. Though these technologies sound scary, some may actually confer welcome benefits. "The potential advantage of neuroweapons is the ability to target general or specific sites and functions of the nervous system to affect patterns of thought, feeling and actions," says Giordano. "Such effects need not — and arguably should not — be lethal." In fact, he says their value comes in their ability to deter the escalation of aggression and hostility to blatant violence. What's more, neurotechnologies could result in a deeper understanding of the brain, which could bring about positive change in the ways that humans relate and interact. "In so doing, we may become both more attuned to the factors that instigate and sustain hate, aggression and conflict, and more adept at preventing or mitigating these factors," he says. At the same time, many of these neurotechnologies could make soldiers more vulnerable, particularly some of the more futuristic-sounding ones. For example, brain-computer interfaces, as they become more prominent in warfare environments, are likely to present new vulnerabilities in addition to benefits. Hacking an army dependent on BCIs could be disastrous, causing soldiers to attack 'friendlies' or accidentally divulge important information. As noted by Chloe Diggins and Clint Arizmendi in Wired, "pacemakers and implantable cardioverter-defibrillators (ICDs) could be hacked, raising fears about the susceptibility of even life-saving biotechnological implants" a vulnerability that "could easily be extended to biotechnologies that connect directly to the brain, such as vagus nerve stimulation or deep-brain stimulation." There's also the potential for some of the "bugs" and "toxins" to get out of control or contaminate friendly troops or unintended targets, like civilian populations. Testing and regulating these technologies pose further complications. "The first user is typically a human subject," says Moreno, "and we have rules about how these sorts of experiments are supposed to be done. We have international laws, federal rules, institutional processes like research ethics review boards, all of which apply to national security agencies, like the Department of Defense, the FBI, and Homeland Security. They have to get informed consent before they conduct these experiments." But as Moreno pointed out to me, what these review systems don't do quite as well is "think about the larger policy implications of a new particular biotechnology — and that's especially important for future warfighters." Which is a hugely important point. These technologies could get very disruptive very quickly. As Giordano pointed out to me, the use of neuro-cognitive approaches could open the proverbial Pandora's Box — in that it could facilitate the development of a greater range of techniques and technologies, while leading to an escalation of neuro-weapons. "This could lead to an expanding employment of brain science for socio-political agendas," Giordano told io9. "This raises questions of whether such neuro-cognitive interventions cross a threshold of inviolability to exert 'mind control'. These possibilities and concerns need to be seriously regarded and proactively addressed. Physicists since the beginning of the nuclear age, including Albert Einstein, understood the dangers of atomic power, and the need to participate actively in managing these risks. The life sciences sectors lag in this regard. Many neglect thinking about the potential risks of their work. My experience suggests that an increased sense of the need to be publicly involved is taking hold among life scientists, especially in the face of recent controversies about stem cell research and intelligent design. Questions of dual-use, writes Moreno, require the informed engagement of "our best scientific thinkers." Neuroscientists should be trained early on about the dual use challenge: how knowledge can be misused for nefarious purposes. The government should be transparent about how it sets policies for neurochemical warfare and the development of new technologies that target the nervous system. Military personnel in particular deserve access to all information about new technologies in this arena, and in general transparency is paramount. Giordano says we need to realistically assess the capabilities and limitations of neuro-cognitive science if we're to establish effective guidelines and regulations to direct and govern the potential use — and misuse — of these powerful tools. "Current treaties may provide some constraint, but new developments in neuroscience and technology by a variety of nations — and even non-state actors — will require more finely-grained evaluation, guidance and control," he says. "At present, there are select multi-disciplinary groups comprised of both civilian and military professionals dedicated to developing neuroethical approaches to dealing with the questions and problems that arise in and from the use of neuro-cognitive science in the somewhat unique aspects of national security and defense. However, this needs to be expanded." He also says it's important to inform and engage the public, but that issues of transparency will inevitably arise as certain aspects of national security will remain classified. Despite all the lofty predictions and the calls for concern, it's very possible that many of these neurotechnologies will never come to pass. Moreno, for example, remains doubtful about their technological feasibility and tactical effectiveness. "I'm a little bit of a neuroskeptic, I guess," he told io9. "At the very least I'm extremely reserved about what I think any of the technical advantages are going to be in all this. Although, I'm certainly not one to say that 'not yet' doesn't mean 'never.' For sure, there are going to be new advances, and we're learning many new things about the brain, but it's not immediately obvious how the things we're learning in the lab setting — particularly among rodents — is going to translate to neuroscience or medical neuroscience, and certainly very little will likely be translated to the military setting." On the prospect of some of the more futuristic-sounding weapons, such as psychotronic weapons, or psychotronics, he says there's simply no evidence that sending "an electronic beam at someone's head from a distance" will actually work. "Another question I like to raise is that, if this is the solution to a commander's problem, then what's the problem?," he adds. Moreno wonders how any of these weapons could possibly be more helpful in a winning a battle or engagement than the tools and equipment that are available right now. "Sure, it's really interesting to speculate about what can be done — though technically most of it probably can't be done — but why would anyone want to use such a thing? Why would a terrorist group be interested in neurotechnology when they could just put a bomb in a car?" Moreno's skepticism aside, there are some definite ways in which neuro-cognitive weapons could confer a tactical advantage. Depending on the weapon used, they could provide short-term and targeted advantages such as disrupting an enemy patrol, or disturbing a terror cell. They're also (conceivably) more manageable than other weapons (chemical- and bio-weapons notwithstanding), and are not likely to be classified as weapons of mass destruction. As Moreno notes, they're better considered "weapons of selective deception and manipulation." And as already noted, it's possible that some neuroweapons may be morally superior. A good example is interrogation. Neurotechnologies could be used to facilitate "loose lips." For example, fMRIs could be used as advanced lie detectors, and oxytocin could elicit trust in a prisoner and get them to spill the beans (though many of these techniques would likely be in violation of various international conventions). Moreno is on the fence as to whether neurotech could ever be used to improve interrogations, which he says is less about the technology than it is about building a relationship with the subject. "As far as we know, there's no good substitute for rapport with the target, including and especially when delivering pain," he says. "But in terms of doing interrogations better, we could have better socio-psychological information about how people respond to certain cues or personality types in the form of person interrogating them." Clearly, assessing and directing neurocognitive science in national defense is not going to be easy or simple. As Giordano told me, "it will require ongoing assessment of the state-of-the-art science and technology, identification of the ways that neuro-cognitive techniques are being used, and modeling and projection of the possible near- and mid-term uses of these methods by various nations and actors."